For Hillary Clinton and many of her fellow women politicians, a single outfit represents an uneasy compromise between gender and power. Undeniable. As political scandals go, this was a decidedly non-scandalous one, and Clinton’s “Tentative Dip Into New Neckline Territory,” as the Post’s headline had it, would—albeit after write-ups in The New York Times and the Times of London and a discussion on Meet the Press—soon be forgotten in favor of the 2008 campaign’s many other teapot-tempests. Today, Cleavagegate serves mostly as a hazy reminder of the particular challenge that Clinton, as a woman who dares also to be a leader, has been made to navigate over the long course of her public life: the media’s often aggressively ambivalent relationship with women who seek power. Her shirt failed to properly—which is to say, abashedly—disguise the fact that Clinton, a wife and a mother and a soon-to-be Madam Secretary, was in possession of a pair of breasts; for that reason, the shirt became the topic of discussion within some of the nation’s news outlets of record. This would of course be neither the first nor the last time that Clinton’s femininity would, via her clothing, chafe against her political and professional ambitions. But it would be one of the last times that Clinton would be “tentative” about her style. The Democratic Party’s new presidential nominee has, instead, settled on a sartorial formula that many of her fellow women politicians, from Angela Merkel to Theresa May to Sarah Palin to Claire McCaskill, have relied on, as well: a simple jacket and a matching pant, over a basic—and usually pointedly high-necked—shell. The pantsuit. The uniform that claims to care more about substance than style, and that fights against longstanding cultural assumptions that women politicians can fairly be judged according to their clothing. The pantsuit is, for the trailblazing woman leader, an empowering paradox: It’s a statement outfit that makes its statement by saying as little as possible. Here is a true fact: It wasn’t until 1993 (1993!) that women were allowed (allowed!) to wear pantsuits on the Senate floor. The “allowing” occurred, in the end, only because Barbara Mikulski and Carol Moseley Braun decided to defy an arcane rule, leading, eventually, to its erasure. (Or to its modification: Pants-clad women are now allowed in the Senate chamber so long as the pants in question are accompanied by a jacket.) The rebellion was fitting: Pants are, in their way, political. Women started wearing them in the U.S. around the same time that they won the vote, and the garments reflected their egalitarian ambition. And suits are symbolic from the other side of the spectrum: They are the ultimate totems of cheerful corporate conformity. They whiff of willful captivity. Over the near-decade since Cleavagegate, Clinton’s pantsuits have evolved from a default uniform—easy, unsurprising, strategically dull—into something more transcendent, something vaguely suggestive of the earliest meanings of the woman-in-pants: She’s taken the article of clothing whose whole point is conformity and made it her unique brand. Clinton lists “pantsuit aficionado,” tongue firmly in cheek and leg firmly in slack, on her Twitter bio. When she joined Instagram in June of 2015, her first post was a picture of red, white, and blue suit jackets on hangers—captioned “Hard choices.” Her campaign’s merch store sells an “Everyday Pantsuit Tee,” the garment emblazoned with silk-screened lapels and a logo-ed brooch, for $30. Last year, Clinton appeared on The Ellen Degeneres Show with a 5-year-old fan who wore an adorably miniaturized version of one of her iconic blue suits. She has made, through the years, many, many jokes about pantsuits. Which is also to say that the pantsuit, like so much else about Clinton’s visible, public life, has been the outcome of decades’ worth of honing and polishing and experimenting. It is a years-in-the-making compromise between Hillary the person and Hillary the persona. 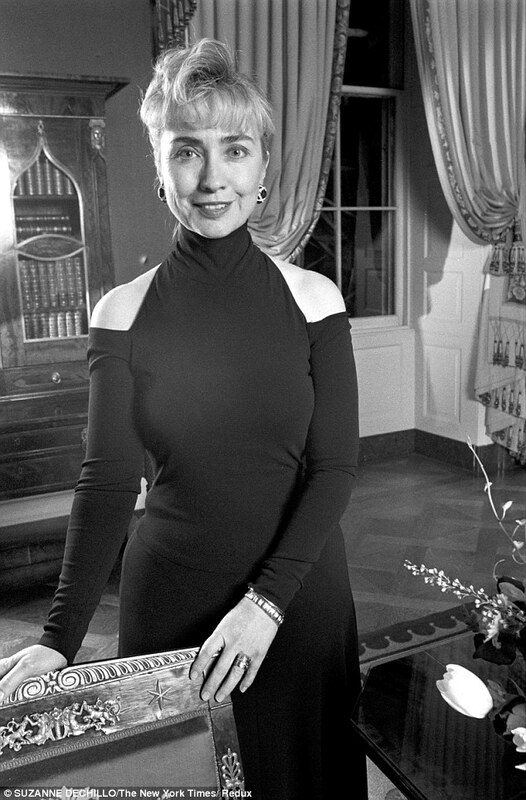 Clinton, after all, did not always suit up. As First Lady of Arkansas, and then of the United States, she experimented with fashion—she even seemed to have fun with it! Ball gowns, daring cuts, shoulder-padded power suits. And: She got mocked for those choices, repeatedly. She got called “frumpy.” And the criticism didn’t end when she assumed elected, and then appointed, office. Remember … Scrunchiegate? Clinton is often accused of distrusting, and of mistrusting, the media in a manner so strident that her aversion verges on paranoia. The journalistic fixation on her clothes, however, and on her appearance overall, whether on her makeup or her hair or her contact lenses, goes a long way to explain that. The media, over the years, has treated Clinton—not always, certainly, but often—with the kind of breathless objectification often on display in celebrity profiles. It has assumed a kind of ownership over her and, by extension, her clothes. Politicians will always offer themselves up to the public in a kind of ritual sacrifice; that includes, as Chris Christie and Bill Clinton and Marco Rubio know all too well, their bodies as well as their fuller selves. For Clinton, though, the collision of forces—the dynamics of celebrity, the dynamics of gender—has been particularly defining when it comes to her portrayal in the media. For her, the talk about clothes—the policing of her appearance—has been a conversation rather than a side note. And that in turn goes a long way toward explaining why Clinton has embraced the pantsuit, which is an outfit that, perhaps more importantly than anything else, tends to preclude itself as a topic of discussion. 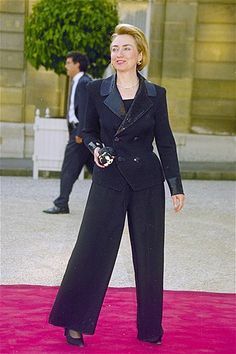 Journalists are biased, above all, toward newness, and there are few things more boring at this point than the headline “Hillary Wore Another Pantsuit.” There can be stories even in suits, certainly, as the debates about the cost of her “extravagant” wardrobe have made clear. For the most part, though, the suits have forced the public into talking about things other than Clinton’s appearance—her ideas, perhaps, or her fitness for public office. In that sense, whether the suit in question is neutral or jewel-toned or a new-beginnings-symbolic white, the suit itself, the form that for Clinton has come to double as a uniform, carries a self-contained message to the media. It is an article of clothing that says, basically, “please stop talking about my clothes.” It is a garment that suggests acquiescence to the public—via the conformity of the suit—and, at the same time, offers a kind of armor from public scrutiny. Our pantsuits, ourselves: It likely will not always be this way. Women politicians who come later, on the kitten heels of Hillary Clinton, may not need to rely on clothing that offers aesthetic predictability in the service of political substance. Glimmers of that more permissive fashion future are already here. Theresa May wears leopard-print heels. Madeleine Albright wore statement brooches. Women leaders in business as well as in politics experiment with sleek dresses and chic stilettos, and their choices are rarely treated, in the media, as compromises to their power. 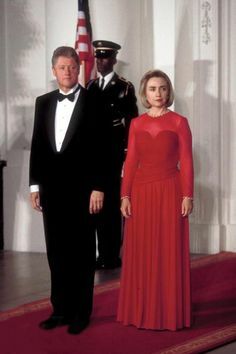 Clinton’s pantsuits, for all they have accomplished for her candidacy, have called to mind Thatcher’s own sartorial motto: “never flashy, just appropriate.” It will be a good day, though, when being “flashy” and being “appropriate” will not be assumed—in fashion as in anything else a woman might do—to contradict each other.